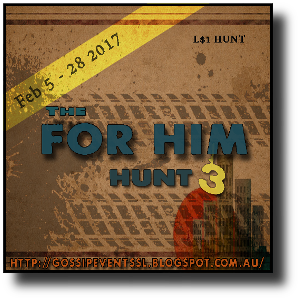 The hunt made just FOR HIM begins February 5th and runs till the 28th. FlyingArts prize this time around is a fun paintball coverall textured in 4 colours of camouflage. All 4 come in clean and “hit” versions using the HUD. You also get a working paintball gun just add, use mouselook and shoot! Happy Hunting!